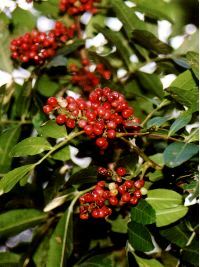 Brazilian peppers, sometimes called the "Florida Holly", are large evergreen shrubs that can grow as tall as 40 feet. In the spring, they have small yellow-white flowers. In late fall, female shrubs produce clusters of red berries. They can be distinguished from similar shrubs by crushing several leaves. If they smell like turpentine, the plant is a Brazilian pepper. Brazilian peppers were introduced to Florida in the late 1800's. They grow rapidly in most habitats, are salt-tolerant, and have no natural predators here. They are very invasive, displacing valuable native plants. They are prohibited and should be destroyed. It is illegal to cultivate, sell, or transport them. Skunk vine is a woody vine that can reach lengths of up to 30 feet. It will cover the ground and plants and climb to tree tops. Shorter vines are elastic and root quickly, making them very difficult to remove. The leaves vary in size and are usually smaller in shady areas. Skunk vine has a skunk-like, or rotten potato, smell. Skunk vine, a native plant of Asia, was introduced in the late 1800's. It is very invasive, growing in most habitats, even underwater, blanketing the vegetation. Skunk vine should be pulled up by the roots and destroyed.